The perfect gift for board game lovers, adults, teens, tweens and all smartphone addicts! 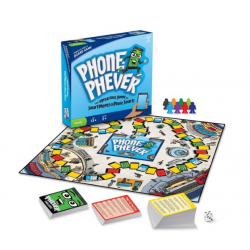 Phone Phever is a new, fast-paced, family-friendly party board game that perfectly blends the wonder of smartphone technology with the simple fun of a traditional board game. Players/teams RACE to answer FASCINATING trivia questions and complete HILARIOUS challenges with the help of their smartphones! Feeding your smartphone addiction, and cravings for social interaction, Phone Phever will provide countless hours of laughter, excitement, conversation, and learning. And best of all, to play Phone Phever, only your phone needs to be smart! Will YOU be the FIRST to reach the Phone Phever store? Players/teams can choose to play Phone Phever with one, some, or all six trivia categories (music, movies, TV, history and technology, law and politics, and the rest of Western pop culture).